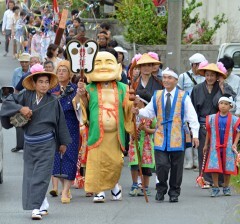 On May 10, at the Furugen district of Ozato in Nanjo, miruku and people performed the michijune parade. On May 10, or April 1 in the lunar calendar, in the Furugen district of Ozato in Nanjo, the miminme festival was held to pray for good crops and prosperity for the community. People walked through the streets for the michijune parade and those watching applauded the children who danced singing miminme shiyapu to a sanshin accompaniment. The parade started from the house of the Teruya family at around 5:00p.m., going around four different locations including the Ashibina Sacred Garden. At the head was a standard-bearer holding a flag featuring an image of a naginata or a long-handled sword to drive away evil spirits. He was followed by a miruku or maitreya, elderly men and women and then children. Participants performed a traditional dance and bojutsu (the art of using a stick as a weapon) at ashibimo or event square. In closing of the festival, miruku performed the kachashi dance with the ward chief, Ryozo Uehara. On May 10, at Furugen district of Ozato in Nanjo, children performed dances.